I've just received my 1.5mm roller and my single needles in the mail today. Thank you! What is the best way to treat ice-pick acne scars? If I use the single needles, what is the best way to needle it? I also have a boxcar acne scar under my eye (located around the bottom of my under-eye circle or "eye bag").. Is that area too delicate to needle? Oh this is interesting. I like to get Sarah's insight on this, too. I mean, what if the ice-pick scars are deeper than the needle can reach and prick? But perhaps for light to mild cases, derma roller can be more convenient. On Acne.org, there is a specific page that tell you the treatment that works for ice-picks scars and boxcar. LINK. Though, it is intereseting to note that this website does not recommend skin needling for boxcar and ice-picks, but only for rolling. You should check the user reviews of each technique on that website! What is your skin type? I have a subscription to Beautypedia, a website that reviews TONS of skin care products. Would you like some suggestions? Describe your skin type for me if you are interested! (Very) Oily? Normal? (Very) Dry? Combination? Are you sensitive to any ingredients in particular? Can you tolerate acidic products? Can you tolerate synthetic sunscreens? I definitely do recommend single needling acne scars, including the ice pick type ones. They are difficult to treat so you have to be patient. Ice-pick scars have an atrophied epidermis and dermis and their depth is usually irregular. They will slowly start to change their shape and partially fill in by triggered collagen induction after repeated needling. Pre-treat with exfoliation, vit. C and A-Ret. Directly before needling, take a facial steambath to soften the skin's keratin. It will facilitate needle penetration. Disinfect the skin. Stretch the scarred skin between your fingers. Needle the scar from different angles, to different depths and do the edges as well. You do not have to insert the full length of the needle but do needle densely. Crush the hardened collagen - this will soften the scar. You should get some pinpoint bleeding. Our needles are approx. 2 mm long, which is enough even for very deep scars. Remodeling of a needled scar takes a long time. Do not get prematurely discouraged. Do not needle the same scar more than once a month. You can needle every day but do a different scar each day. Once a month, roll the entire area with a 1.5 mm dermaroller. 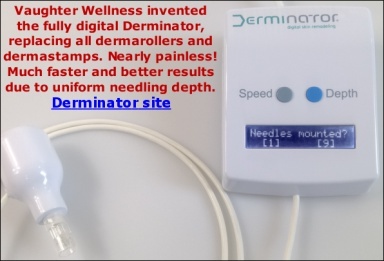 Indeed, if your scars are very mild and shallow, dermarolling without single needling is sufficient. Concerning the scar under your eye: You have to be extra careful. When you put your finger under your eye, you'll feel a bone. Do NOT roll/needle closer to your eye than where that bone is. Pull/stretch your skin downwards from the eye with your other hand and roll it with the other.